Dubbed ‘The Arabian Resort of Dubai’, Madinat Jumeirah is a luxury resort that is an experience, complete in itself. 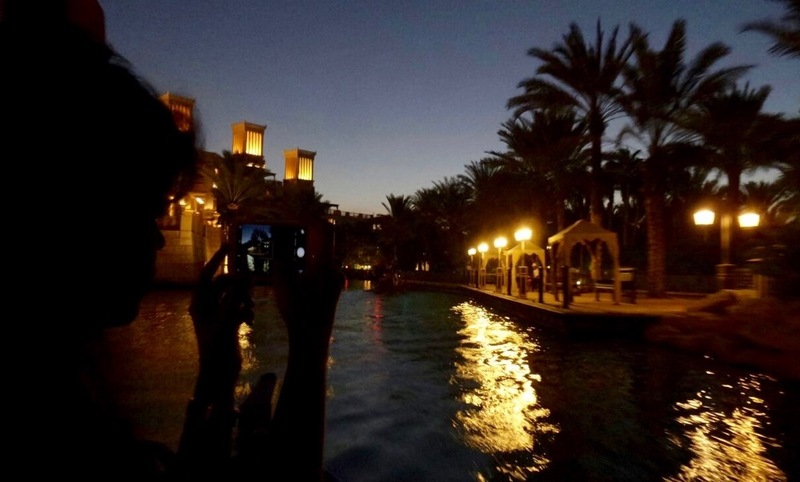 This wide-spread resort has over 3kms of waterways and a boat ride in the traditional Arabain Dhow along these is a pleasant way to spend a quiet evening. More so, towards the last few months of the year when Dubai is relatively cooler. Quite self sufficient in itself, this resort boasts of housing over 40 restaurants, traditional summer houses, grand ballrooms and even an entertainment centre of its own! All set alongside a private beach, with a view of the Burj Al Arab. I did miss going on to beach for that now famous shot of the Burj Al Arab, but the experience was lovely nonetheless. & for a dose of some local retail therapy, the ‘Souk’ here is the answer. A ‘Souk’ is the traditional bazaar of the Middle East and The Souk Madinat Jumeirah is a pretty faithful recreation of it, with its winding streets and wooden archways. You can get your name written in sand of myriad colours. and, watch the artist at work, bringing to shape your vision! I had read about them a couple of years ago in an in-flight magazine of an Asian airline, but couldn’t really remember the name, except for their beautiful hand painted elephants and the cause that they stood for. When I did finally see the elephants, I almost went – ‘Hey, I know you’ !! Love the pics taken from the boat and of course those elephants!! Great Post.Happy New Year 2016 .